Materials. Any resin available in liquid form can be cast. Castable resins include phenolics, polyesters, epoxies, silicones and acrylics. Types of molds. The type of mold used depends on the plastic, the size and shape of the part, and other design considerations. Draw mold一No undercut is possible. Flutes and scallops must run in the direction of removal. Taper must be provided to break the vacuum and reduce friction. Castings are removed by force, and minimum wall thickness is critical, running from 1/8 in. on tiny parts to 3/16 in. on parts the size of radio cabinets. Split mold~Undercuts may be provided if they do not prevent release from the separate parts of the mold. Minimum wall thickness is 3/16 in., and parts less than 0.1 lb are not commonly produced economically. Cored mold~This type allows complexity of design, but is not usually feasible from a cost standpoint for parts less than 4 x 4 x 4 in. Molds require no taper. Minimum wall thickness is 3/16 in. Mold shrinkage allowance must be considered. Extremely large parts may be cast. Flexible mold一Model may be constructed of wood, porcelain, metal, etc. Mold is of plaster with a lining of rubber latex or an elastomeric plastic. Epoxy materials may be cast in flexible molds, but most polyesters react with the lining material. Although parts cast in rubber molds cannot be held to the tolerances possible with matched metal molds, a reasonable degree of accuracy is reproducible. For example, on cast phenolic parts dimensions can be held to about ±(0.004 in. per in. The degree of accuracy obtainable on any part depends on the oversize allowance used in making the master pattern, the care with which the pattern is made, and the degree of accuracy attained in calculating amount of shrinkage during cure of the rubber mold and the cast resin. In many cases, extruded parts are competitive with molded parts. Where many parts are required with a complicated cross section in one plane, the cross section can be produced by extrusion, and the parts formed by rapid, automatic cut-off to shape. 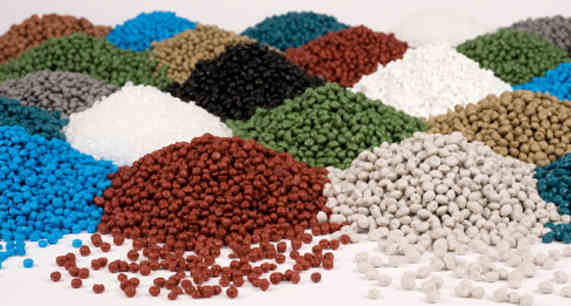 Thermoplastics.In extruding a thermoplastic, the molding powder is fed through a hopper to a chamber in which it is heated to plasticity at a controlled temperature. The plastic powder is then driven, usually by a rotating screw, through a die having the shape of the desired cross section. The process is continuous and is used to produce tube, rod, film and sheet, as well as other continuous shapes. Thermosets. Reinforced thermosetting tube and rod can be produced by an extrusion process. The reinforcing fibers are fed continuously through a bath of liquid thermosetting resin and then throu功 a die of the desired cross section. The extruded shapes then pass through a cylinder held at a controlled temperature to polymerize and cure the thermosetting resin. Extrusion speed must be relatively slow to provide sufficient time for complete cure.